Don’t wait for a visit to a 5-star bistro to savor a decadent veal chop; make it at home tonight to rave reviews. 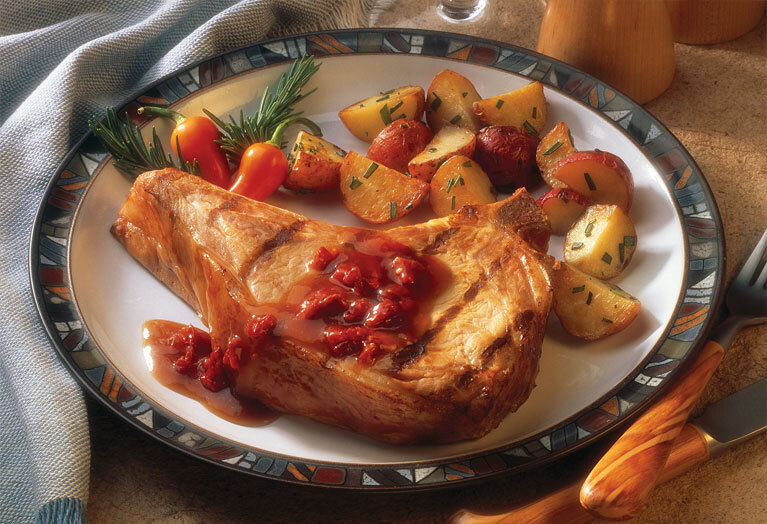 This veal chop recipe is so simple: just grill the chop to perfection and pair it with any of your favorite sides. No one will be calling for reservations anytime soon after experiencing this veal perfection. Combine 1 teaspoon garlic and rosemary; press evenly onto all surfaces of veal chops. Place veal on grid over medium, ash-covered coals. Grill, uncovered, 13 to 15 minutes for medium (160°F) doneness, turning occasionally. Season with salt and pepper, as desired. Meanwhile, combine sauce ingredients and remaining 1/2 teaspoon garlic in small saucepan, stirring to dissolve cornstarch. Bring to a boil, stirring constantly; cook and stir 1 minute or until thickened. Serve veal with sauce. Garnish with parsley, if desired. 115 mg cholesterol; 0.5 g fiber; 4 g monounsaturated fat; 0.5 g fiber; 15.3 mg niacin; 0.3 mg Vitamin B6; 1.3 mcg Vitamin B12; 1.4 mg iron; 14.2 mcg selenium; 3.9 mg zinc; 117.8 mg choline.